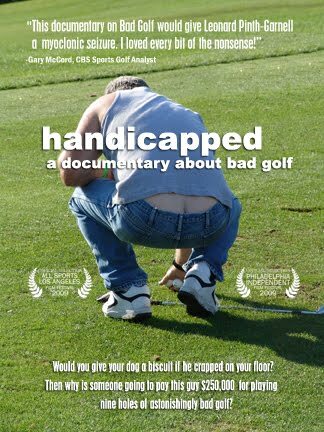 When I first saw the trailer to Handicapped: A Documentary About Bad Golf I definitely shook my head and had a bit of a laugh. In some way this movie for those of us who are golf handicapped can relate. Spalding Smails from the original Caddyshack makes an appearance. It’s true. John Barmon, who played Spalding in Caddyshack, participated in the tournament we documented. The movie chronicles the third annual Albert J. Doermaet Average Man Invitational, a tournament created explicitly for bad golfers by an over competitive former football coach turned portable toilet magnate who’s made hundreds of millions of dollars. The movie won awards at the All Sports Los Angeles Film Fest and Naperville Independent Film Fest. Check out the trailer and you be the judge. The DVD will be released on November 24. On sale at IndieFlix.com.